To request a free visitor guide from Olympic National Park - Orientation, please fill out the form below and click "Submit". 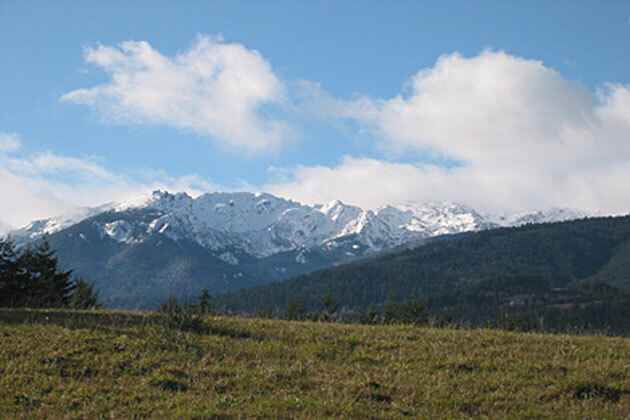 Olympic National Park is made up of three distinct regions. Take a moment to look through the information below to gain an orientation on the park's layout to better ensure a great visit. There are three very distinct portions of Olympic National Park: along the rocky Pacific Ocean coast, glacial mountains that dominate the Olympic peninsula, and the temperate rainforests that fill the valleys with old-growth forests. Any single area would provide enough hiking and photographs to fill a national park, here the chance to see all three in a single trip is sensory overload. Over 90 percent of Olympic National Park is designated wilderness area. Although there are a few roads, to explore the park fully you must leave your vehicle behind and travel on foot. As a reward, pristine windswept beaches, moss draped towering trees, and the alpine meadows home to unique flora and fauna will be yours to discover in solitude. Roughly 70 miles of Pacific coastline is contained within Olympic National Park. Each section of beach is unique - broad sandy dunes, tidepools and crashing waves, and 100-foot cliffs tumbling into the ocean. Almost all the coastline is open for hiking and backpacking, but a tide table is a necessity. Many hikers have found themselves stranded against the cliffs when the tide comes in. From south to north, the three ranger stations along the coast are the sandy Kalaloch, rocky Mora, and Lake Ozette. Kalaloch - A long, broad, and sandy beach stretching between the Quinault and Hoh Rivers. Nine beach access points up to Abbey Island and the beautiful Ruby Beach are all worth visiting. Mora - Guarding the access to Rialto Beach, numerous trails heading both north and south start here. For those not camping at the 90+ campsites, a 1.5 mile hike along the sandy beach north to Hole-in-the-Wall is a great short excursion. Lake Ozette - Several miles off the coast, Ozette Lake offers primitive campsites and boat ramps on the lake, and boardwalks and trails to the coast. The beaches here are very rugged and unmaintained, but proper footwear allows you to explore preserved northwest culture as well as the forests and beaches. The Olympic Mountains to the east catch and filter the constant ocean moisture, resulting in a temperate rainforest of unparalleled beauty. Gigantic trees, moss and fern covered ravines, and Roosevelt Elk are just a few of the marvels to explore in this area. The west side valleys enjoy over 12 feet of rain a year, so come prepared to get a little wet. Giant western hemlocks and Sitka spruce are a few of the tree species that grow to record heights here, and many are within an easy hike. Hoh River - Following the Hoh River from the forested visitor center west for 18 miles to the source of the Hoh, the Blue Glacier trail leads to the base of Mount Olympus. Hall of Mosses - This short loop traverses a grove of old-growth forest near the Hoh River Visitor Center. Quinault Lake - Several campground and lodges border this glacial melt lake. Short hikes around the lake include a 0.2 mile walk to the largest cedar in the United States. The southwestern extent of the park, Quinault Lake is the portal for miles of trails leading into the mountains. On the north and east side of the park, lowland forests are drier than their western cousins, but no less lush. Extensive old-growth forests leading to subalpine wildflower meadows are studded with some of the best trails in the park. Staircase - On the west end of Lake Cushman, numerous hikes from under a mile to over twenty miles access forested lakes like Wagonwheel and Flapjack, and the entire north fork of the Skokomish River. Heart O'the Hills - Just south of the park headquarters in Port Angeles, and boasting numerous campsites, highlights of this old-growth forest include a 3,350 foot climb to wildflower meadows around Heather Park. The Olympic Peninsula forms a bulls-eye with the surrounding coast and forests centering on more than 600 square miles of alpine ridges, glaciers and rugged peaks. Wind-sculpted subalpine forests stand in contrast to the giant trees found at lower elevations. Most of the mountains are difficult to reach even during summer months, but an extensive trails system of over 900 miles rewards hikers and backpackers with diverse options and immense panoramas. Hurricane Ridge. Seventeen miles south of Port Angeles, Hurricane Ridge is the park's destination for winter activities, and the most reliably accessible mountain destination in the Olympic Mountains. It’s also the most visited location within the park during non-snow months, as it offers the best view into the interior mountains and Mount Olympus. Wildflowers abound in the spring and numerous deer provide ample photographic opportunities. Perched on the top of a windblown mountain the Hurricane Ridge Visitor Center welcomes visitors with interpretive exhibits, snack bar, rental equipment and park staff to answer questions. Hiking trails depart from here into the Park back country. Deer Park. Accessible only in the summer, this steep ridge traverses the rain shadow of the Olympics and is a great starting point for a backpacking trip in the northeastern park of the park. This road is closed to RVs and trailers. To help all visitors enjoy the park, to provide for you and your pet's safety and to protect park wildlife, please observe the following rules. Pets are permitted only in park campgrounds, picnic areas and parking lots, along with several ocean beaches. Pets are not allowed in the park's designated wilderness, in public buildings or in boats on park rivers. Pets must be on a leash (up to six feet long) at all times. Pets are allowed in campgrounds, but must be kept on a leash or in a kennel at all times. Leashed pets are allowed on trails in Olympic National Forest. Please note that this is a different entity than Olympic National Park.